Monday morning I woke up 2 hours before my alarm went off with a hankering for some cake. My stomach was grumbling and I could not fall back asleep. I had a decision to make. Should I (a) get ready and go to work early or (b) bake a cake? Clearly, I was not about to go to work early. Who even does that? 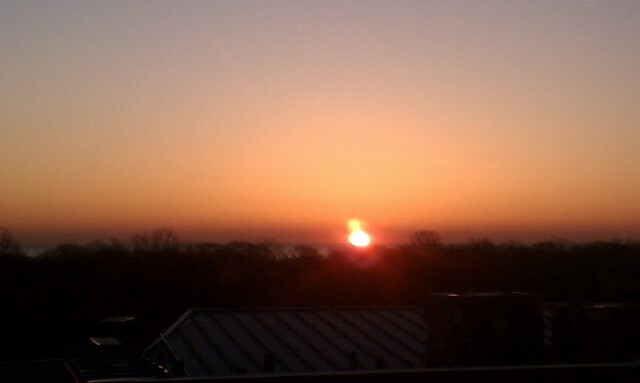 So instead I baked a breakfast cake and watched the sunrise over Lake Michigan from my living room window. 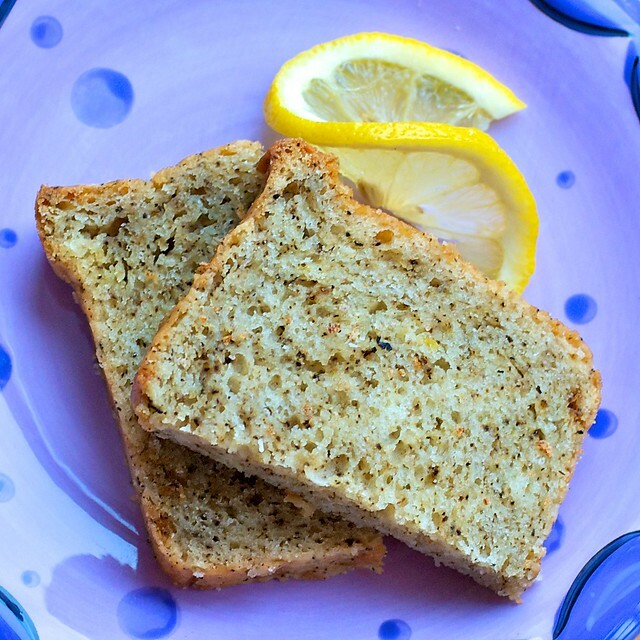 The thought that came to my mind: earl grey paired with refreshing lemon in a moist delicate pound cake. Lately I’ve been enjoying the Teavana Earl Grey Creme tea that my mom gave me for Christmas. I can’t get enough of the stuff. Smooth flavors of vanilla and citrus bergamot. Thoughts of this tea are forever dancing around in my head–probably why I’ve been wanting to bake a cake with earl grey flavors for the past couple of months. The results of the cake were stunning. The texture of the cake was oh-so-perfect with a practically melt-in-your-mouth crumb. The flavors were a perfect pairing (well duh, it’s not like I came up with that idea… thank you, England). 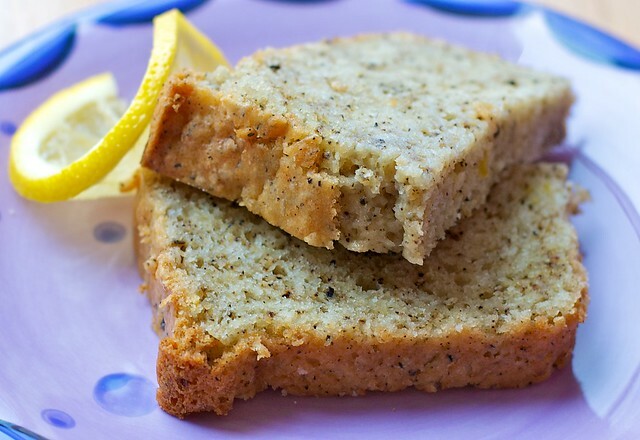 The earl grey tea is the focus of this cake and there is a subtle zesty lemony aftertaste. The cake rose up higher than my loaf pan during baking and had a nice crispy edge on top, just like a cupcake or muffin. Needless to say, I was really glad I decided to bake this cake in the wee hours of the morning. My afternoon slice of cake at work pretty much made my day. Not to mention it got the roommate stamp of approval: when I got home that night, more than half the cake had been consumed. I snapped a picture of the sunrise on my camera phone. It’s not exactly stellar photography, but I’ll share it with you anyways. Such pretty colors. 1. Warm the soy milk until hot and add the 1/2 tsp of loose leaf tea to it. Steep for 3-5 minutes then strain out the tea leaves. 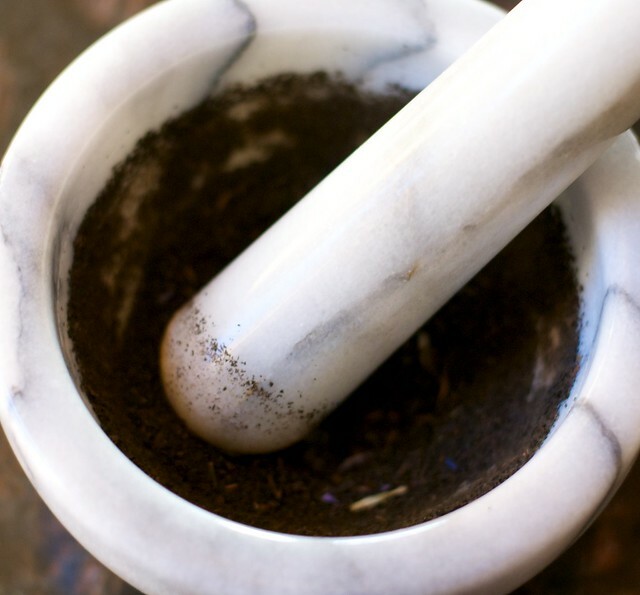 Meanwhile grind the tbsp of tea in a mortar and pestle or a spice grinder. 2. Combine sour cream, tofu, sugar, earth balance, vanilla extract, lemon extract, and lemon zest. Beat with electrical mixer until smooth. Add the steeped soy milk and mix. 2. Add in the flour, ground earl grey, corn starch, baking powder, baking soda, and salt into the wet ingredients. Mix by hand until a thick batter forms. Do not over-mix. 3. 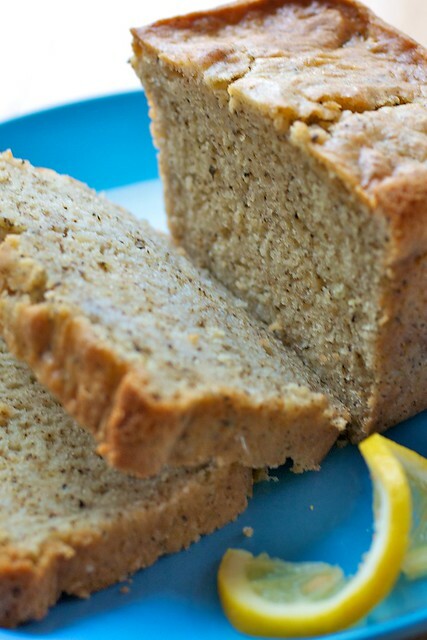 Pour into a pre-greased loaf pan and bake for 60-70 minutes until a toothpick or knife comes out clean. 4. Remove from oven when done cooking. Cool the cake in the pan for about 10 minutes then transfer to wire rack and allow it to cool completely. I hear the cake pairs well both with tea (especially earl grey tea–no such thing as too much!) and coffee. This entry was posted in dessert and tagged earl grey, lemon, pound cake, vegan. Bookmark the permalink. How amazing this cake sounds. I will have to bake it! Love that you’re the kind of girl who wakes up early to bake a cake and watch the sunrise! This looks delicious. I’m not vegan so the use of silken tofu, soy milk, and vegan sour cream and butter is new to me. Since I don’t have these ingredients readily on hand, would this recipe work equally well if I used regular dairy ingredients?